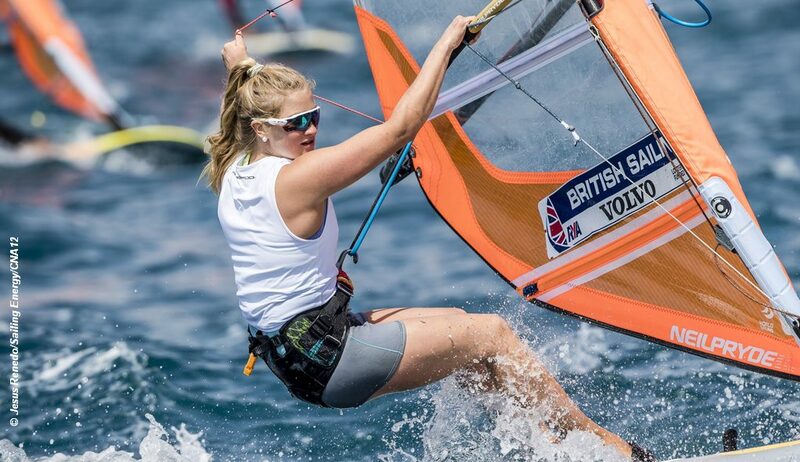 Only two British Sailing Team competitors made the cut-off for the RS:X European Championship medal races, not a great result but probably a fair reflection of the present strength of the British RS:X squad. In the women’s Open Championship, Emma Wilson put herself into fourth place overall and the chance of a European title podium finish after a final day 5, 1, 8 scoreline. Bryony Shaw dropped to 17th overall. While in the men’s Youth event Finn Hawkins managed to hang on to tenth place, and a medal race place. Overall Kiran Badloe and Dorian van Rijsselberge of Holland take the top two spots in the men’s Open Championship, with Thomas Goyard of France in third place. Louis Giard of France and Byron Kokkalanis of Greece are also medal contenders. In the women’s Open Championship Yunxiu Lu of China has a 7 point lead from Charline Picon of France, with Holland’s Lilian De Geus only two points back and in contention for the European title. Emma Wilson is three points off the two European competitors and only five points off the European title. Whilst Wilson has the Under 21 title secured, she is aiming to repeat her bronze medal from 2018. In the women’s Youth championship Heloise Macquaert of France now leads by 2 points from Naama Gazit of Israel, and in the men Fabien Pianazza of France leads by 3 points from Nicolo Renna of Italy.